Would a near extinction event spur an interest in space travel? What do Viking colonies teach us about space colonization? The former offers a dire lesson about why the latter may become necessary. Paul Gilster of Centauri Dreams discusses the circumstances that could force humanity to avoid a "planetary Greenland." Although Jane Smiley has made the haunting story of the Viking settlement of Greenland widely known in her novel The Greenlanders (Knopf, 1988), we have few modern accounts that parallel what happened in remote places like Brattahlið and Garðar, where Erik the Red's settlements, which had lasted for 500 years, eventually fell victim to climate and lack of external supplies. But local extinctions and near-misses are important because, as John Hickman explains in his new book Reopening the Space Frontier (Technology and Society, 2010), they promote the kind of story-telling that Smiley is so skillful at, advancing the case that not just settlements but entire species can fail when conditions turn ugly. In this excerpt from the book, Hickman writes about three modern parallels to 15th Century Greenland, the first being the Sable Island mutiny, where provisioning ships to a French penal colony in the north Atlantic stopped arriving in 1602. The demise of the Sadlermiut Inuit is another case in point, the 58 remaining members of this Dorset culture population expiring due to the effect of infectious disease after a Scottish whaling ship reached Hudson Bay. And then there is Clipperton Island, an eastern Pacific atoll that collapsed when provisioning ships stopped bringing supplies during the Mexican Revolution. Why don&apos;t people understand the urgency of colonizing other planets? Recent events such as the 2005 Indian Ocean tsunami, the 2008 tropical cyclone in the Irrawaddy River Delta, and the 2010 earthquake in Haiti which each killed more than 200,000 people provide powerful reminders of the vulnerability of our species to natural disasters. What they have not done is increase awareness of human vulnerability to extinction. Interviews with people who had managed to cheat fate by surviving catastrophes do not incline viewers to consider the possibility of a global catastrophe without human survivors. News audiences around the planet learned about each of these events via television news coverage, which means that the emotional impact of each event was cushioned by the medium's entertaining and anesthetizing unreality. If these tragedies were rendered to that degree unreal then the possibility of human extinction must seem impossible. Thus it is that, while we know about the risk of impacts from space and have funded efforts to detect incoming debris, we have yet to devise a well-funded solution to prevent such an impact. Having little experience with truly existential threats, and having seen nothing but the excavations at scattered sites like those above to remind us how a culture can collapse and disappear, we fail to accept the severity of long-term risk. Hickman thinks we're hard-wired to recognizing only the immediate, a consequence of evolving in environments that did not demand a longer perspective. Rather than evolve a general perception of risk and a rational calculation of relative risk, our 150 millennia living as hunter-gatherers and the most recent 2 millennia living as farmers prepared us to deal with only some kinds of risk. We respond strongly to those with a high probability of occurring rather than to those with a low or unknown probability of occurring. Warfare, subsistence failure and cooperation failure have produced an animal that is equipped with "specific cognitive adaptations for perceiving cues regarding the likelihood and magnitude of adverse events" and for making rapid decisions based on "risk-risk" trade-off calculations. And so it is that three million Italians continue to live around the Bay of Naples near Mt. Vesuvius, the consequences of whose historical eruptions are available for all to see in the ruins of Pompeii. People live by the millions along fault lines in California that could spawn catastrophic earthquakes, coping with a threat of extinction that is, in many ways, too abstract to visualize. We get on with daily life. Our perception is deeply human and understandable, and it offers a recipe for playing down security for future generations in favor of proceeding with today and stressing how infrequently catastrophes occur. Short-term means getting through a finite lifespan, and it doesn't extend to the kind of lapidary effort that builds a safer future for generations beyond. It's a difficult truth to acknowledge, but it seems to be part of human nature. Our innate assessment of risk means we have a steep wall to climb to promote the well-being of our distant descendants, and that makes even the most basic attempts to survey the population of near-Earth objects a matter of constant watchfulness to ensure the continuation of funding. Getting into space to prevent an asteroid strike that might not occur for millennia is a hard sell, and so is establishing a space presence to ensure species survival in case anything happens to our planet. Read the excerpt from Hickman's book and you'll understand why it may take a near-fatal event (think of the survivable asteroid strike in Clarke's Rendezvous with Rama) to make long-term danger immediate and reinvigorate our will to master space technologies. 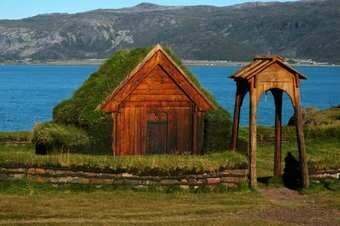 Image: A reproduction of a Norse church in Greenland, with Eriksfjord in the background. Credit: Hamish Laird/Wikimedia Commons. This post originally appeared on Centauri Dreams.